A taste of Italy - Pebbles, Inc.
Hey everyone, Michelle here today with a new LO to share using the Chasing Adventure collection. My kids have always been pretty independent. From a young age they wanted to do things for themselves. I snapped these photos of them making pizza when they were about 4 and 6. I miss those days so much! I started off my LO with the Geo Globe cut file from The Cut Shoppe. The circle and triangles pieces reminded me of a pizza and pizza slices. I backed some random pieces with pattern paper. That woodgrain paper could not have been a better match for my photos! And of course I had to stitch the pieces too! 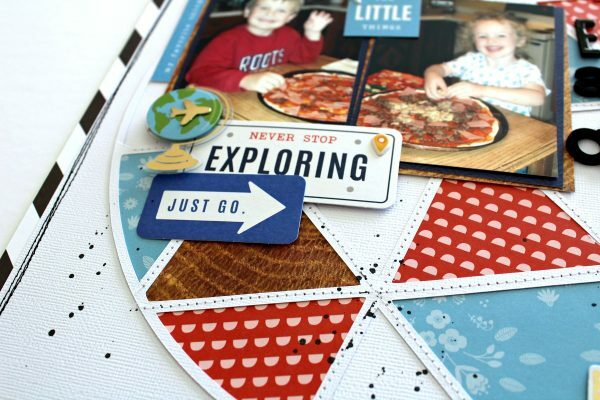 This collection has so many fun travel themed embellishments. Although we didn’t actually go to Italy, we can eat the pizza and pretend we did right? I then finished the LO by adding stitching to create a border and I splattered some black mist just to tie in all that black.